The underlying focus of this year’s Throne Speech continues to be the “policies of recovery and hope we’ve put in place – completing the economic turnaround we were elected to bring about,” Premier Michael Dunkley said today [Nov 16]. The Premier, who was joined by other Ministers and MPs, was speaking at a press conference held today, with the briefing following after Friday’s Throne Speech. Premier Dunkley said, “The Speech makes the point that Bermuda is a work in progress. Building a society that meets peoples’ needs and that empowers them to make the most of their lives takes time. “The Government can’t do everything at once, and this is especially true given the constraints of soaring deficits and debt that we inherited in 2012. “And so we’ve had to prioritize, deciding what activities can do the most good for the most people. “Our first order of business as a Government was to do whatever we could to turn around the economy. We focused on that because economic turnaround held the potential to help more people more quickly than anything else. 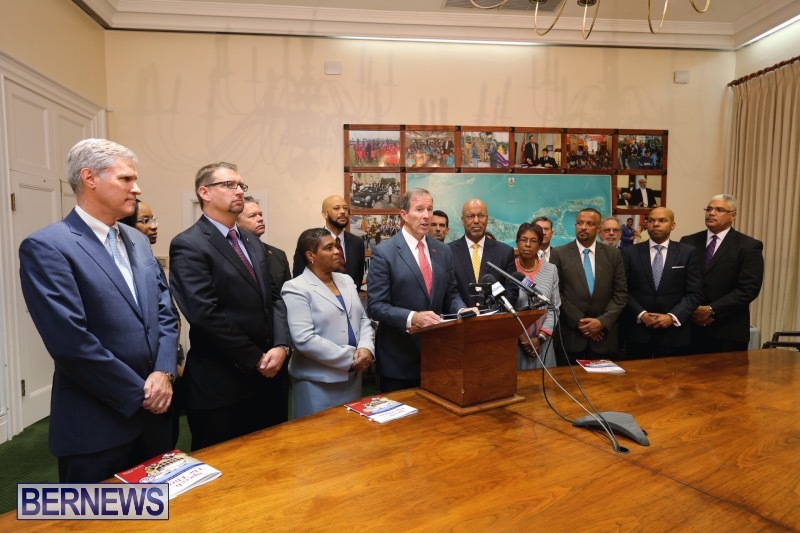 “We’ve made significant progress since then, restoring confidence in Bermuda and its future. The economy is finally growing after years of decline and stagnation. “Economic indicators are showing that what we are doing is what we should be doing, and that the Great Recession is finally over. “What they don’t say – and what we know to be true – is that we still have a long way to go. Too many people continue to struggle, too many are not yet part of recovery, and it is for these people that we continue to work. “The underlying focus of this year’s Throne Speech, then, continues to be the policies of recovery and hope we’ve put in place – completing the economic turnaround we were elected to bring about,” Premier Dunkley continued. “And so we will push for shovels in the ground for a St. George’s hotel early in 2016. We will push for resort developments to proceed at Ariel Sands and Morgan’s Point and for the completion of America’s Cup preparations at Dockyard. “We will continue to maintain and grow international business sector because of its beneficial impact on Bermudian businesses and workers across the board. “And we will proceed with work to restore balance to the country’s finances – helping Bermuda get out of the mire reflected in Auditor General reports just tabled in the House of Assembly. “This is a situation that will take generations to correct, but this Government has a responsibility to stabilize the situation now, as best we can, and a duty to ease the burden on generations of Bermudians not yet born. “Parallel to this work, the Government will bring forward an array of progressive measures to improve quality of life. “Social support programmes that have helped individuals and families weather recession will continue. There will be an expansion of human rights protections. “We will pilot initiatives to ensure the care and protection of senior citizens and for persons with severe disabilities. We will protect and nurture the interests of children, in the home, at school and across the Island. “We will continue with measures to make your government more accountable, more open and more transparent. We will take measures to protect people in our ever-expanding lives online and to restructure our energy future to make sure it is reliable, secure and affordable. “We will do whatever is necessary to continue the positive trends in public safety. And we will grow democratic participation through absentee balloting. “There is much to do to make Bermuda work better for its people. We are fully committed to the task, and we are confident we will progress the interests of the country in a tough and uncertain environment. The most embarrassing political party we’ve seen. So the end of recession, increase in protection for the most vulnerable, Americas cup, independence for the Human Rights commission, 5 separate and large investments into hotels….. Your comment is a clear insight that this is scarier to you and the PLP bloggers than anything that has come so far. No spin, disinformation or outright lies can compete with the truth, the OBA are doing a better job than your lot were when they were ousted. Despite all their juvenile talk of bringing down the government this government is getting to work and I’m glad I voted for them. You must have missed the Auditor’s Report for 2010, 2011 & 2012. Talk about embarrassing. The part when they blamed the civil servants for not being skilled enough to manage their finances and simple contacts? Still waiting to hear Chip pipe in on that AG report. Or any of the faithful. Or any of the PLP ministers. Where is the grave concern? Maybe you should drink more Onion Juice. The Potato/Potatoe was your drinking makes you troll more. Hardly surprising since you obviously had your eyes closed between 1998 and 2012. I’m guessing you closed them again when the Auditor General’s report came out. Onion Juice has amnesia….coough…I mean a selective memory. Trust babies at a boat race. Recession over, America’s cup, independence for the Human Rights Commission, more protection for the most vulnerable, hotel projects blossoming in all areas…. Your post reaks of fear of all this. This is the worst thing that could possibly happen for you and all PLP bloggers i.e. the OBA is doing better than the PLP did when we voted them out of power. 2016 and 2017 are going to be great years for Bermuda. lets keep it going guys! Bang up job Mr. Premier and cabinet ! Bang up job is right. Prices on essential goods have gone through the roof, while Bermudians paychecks have gone down. But hey we are hosting the billionaires club playdate, so it’s ok.